It’s October 31st and we’re just getting settled into Camp 3, this of course being the third night we will occupy Camp 3, Garry, David and myself. It looks very different than it did the last time we were here. Here at 7200 meters, I just had the Kestrel 3000 anemometer out and it I got it to register 1.8 miles per hour wind speed at something like south-southeast wind direction. I had to twirl the thing around for a few moments to get it to register anything so I think it’s safe to say that wind speeds here at Camp 3 the evening of October 31 would be described as negligible in any weather reporting arena in the world. Above me at the South Col I think it’s probably close to the same. It’s always somewhat windy up there but, just like the Sherpas saw yesterday, I think it’s very mild. I’ve begun to see clouds forming first on the north side of Everest, again just as I said yesterday, without any sheared off tops, without any perceivable speed, they seem to be moving in a westerly direction. But these are very benign clouds. You could have definitely summitted Everest yesterday, you could have definitely summitted today. I’m confident we’ll get to the South Col tomorrow and hope that the trend continues. We’re doing well. David has a bit of a stomach bug which is always unfortunate at this time of the trip for climbers because he got on the antibiotics, now he’s trying another one. He’s trying some nausea control medicine, all the stuff we have. But you get concerned as you’re moving high that the medicine takes something out of you. Sometimes I wonder if it’s as effective at high altitude. He’s a little off today due to that. But he moved up the Lhotse Face really well, better than any other day, because we’re just stronger now from the altitude I think. So we’re hoping that is something that will trend in the right direction over the next 48 to 72 hours as well as we go for the summit. You probably know, from following past Everest dispatch, the plan at this point. We occupy Camp 3, the Sherpas do not. They know all about those Camp 3 headaches I’ve described before. They don’t have to stay here. What will happen tomorrow morning is that they’ll get up very early at Camp 2 and they’ll probably roll through here at about 9  9:30 in the morning, which allows the sun to hit camp for us. 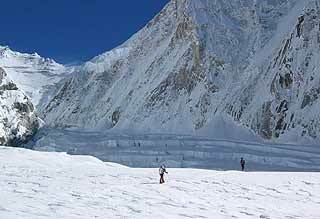 Then we’ll all move on to the South Col together, through the Yellow Band and the Geneva Spur and on up to the South Col.
At this stage of our summit attempt, I really ought to mention the Sherpas. All six of these guys, the climbing Sherpas, have been outstanding. They’re excited. 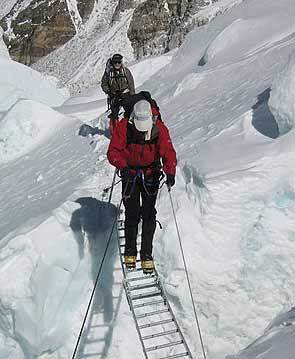 I think one of the misconceptions about climbing Sherpas on Everest is that the just do it for the money. Certainly, it’s great money and these guys often, with the misgivings and out-and-out objections sometimes of their families, come up here and do it. But I can guarantee you, I’ve seen it time after time, at this stage of the game they start smelling the summit and success. They have the same ego drive the Western climbers have. We’ve seen it over and over. They have already brought the fact up to me that we may be the first team to summit in November, which I believe will be true. I didn’t even mention that to them, it’s a point of pride to them. Brad, early in the expedition, interviewed these guys and brought me the statistic. I hope I get this right. 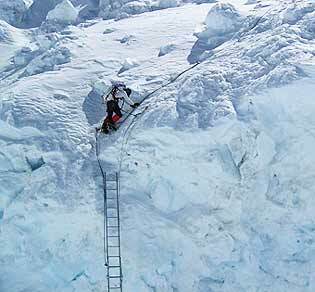 Amongst the Sherpa climbing team of six, there’s 26 successful past Everest summits. If you add my summits, Brad says we’re at 30. I think I’ve got those numbers right. The point being that these guys are proud of their past accomplishments. They are outstanding athletes, they’re proud mountaineers. One fellow in particular deserves noting. Amongst those 26, including myself 30, successful summits in the past, there’s one guy Lakpa Gelge who has yet to summit, even though he has been on five previous Everest expeditions, has worked on film projects here with David Breashears, and I think most notably to myself, he has five successful Kilimanjaro summits from working on the Imax film on Kili with David there. He’s just never had a summit day, and I can tell you the guy would love to get it. And I’d love to see him get it the day after tomorrow, November 2. So we’re a proud team, a determined team. 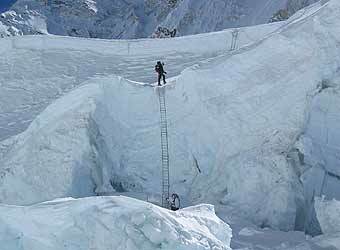 All of the six climbing Sherpas will not go to the summit. We’ll leave some people behind in support, to be determined. The other notable thing about these guys  for every one of these guys that tells you that he summated seven or eight times, what he’s not telling you is that he’s probably been to the South Col or even the South Summit as many times on other expeditions when duty called him to stay lower. But as I said with all the due humility that Sherpas and good Buddhists have on the mountain, and that Garry, David and myself have, we smell a summit right now. We’ll be reporting to you as we move up to the South Col tomorrow and get closer. Down at Base Camp, I’ve got to interject this right at the end, our support team down there is appreciated. They’re doing great work.